Welcome back! 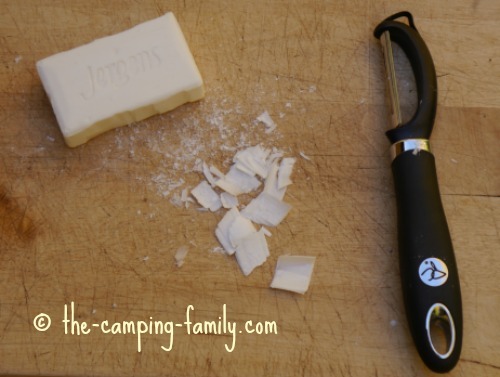 There are some great camping hacks on this page - and a couple of duds. You'll learn about how to set up an efficient handwashing station at your campsite, and about the best kind of travel soap. You'll see a cool way to store your pots and pans at camp. Make candle stakes for romantic nighttime lighting. I asked my husband to try this hack for me. (He's the one with the power tools!) He reported that it was frustrating and annoying. The directions tell you to use a drill to make a hole in the bottom of a taper candle. There's just one problem: there is a wick in the middle of the candle! The drill hits the wick and veers to the side, wrecking the candle. There's another problem, too: the friction of the drill melts the wax! My husband persevered, though (he's that kind of guy) and managed to get one candle drilled. Once the drilling was done, it was relatively easy to jam the candle onto a dowel. A burning candle on a stake does look nice on a dark night. My husband doesn't think so! I think the crackling of a campfire is much nicer, anyway! The verdict: If you happen to have a power drill, a long dowel, a bunch of candles and a lot of patience, go ahead and try this. Otherwise, don't bother. Yes, you can make soap leaves this way - and it's kind of fun - but do you really want to? If you do, be sure to use a hard bar of soap - like Jergens, or Ivory - not a soft bar from the natural foods store. It's easier to get small pieces from a hard bar. But even then, the very smallest flake that I was able to make was still too big for a single handwash. I ended up wasting lots of soap, because each soap leaf was more than I needed. And how do you store and carry them? In an empty plastic container? Digging out just one leaf will be tricky, and you'll probably waste even more soap as you try. Probably one large soap leaf would be just right for a shower, but I didn't try that. I think I'd find it annoying to use just a sliver of soap. 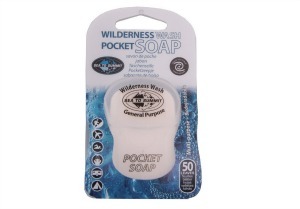 For backpacking, I pack a travel sized bar of soap (the kind you get in motel rooms). For hand washing, I recommend buying single use soap leaves. They come in a handy container that lets you easily take out one at a time. The leaves are tissue paper thin - just right for a single hand wash. 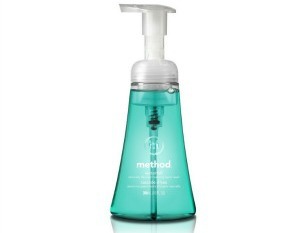 In fact, if your hands aren't really dirty, you can even rip each soap leaf in two and use just half a leaf each time. The verdict: Making the soap leaves was fun, but they are too big for handwashing. These aren't just for camping! I keep a sleeve of soap leaves in my purse and one in the car at all times. They are really handy! Nope. I'm not going to do this. My handwashing water is also my cooking water - and I don't want to cook with water that might taste like laundry detergent! 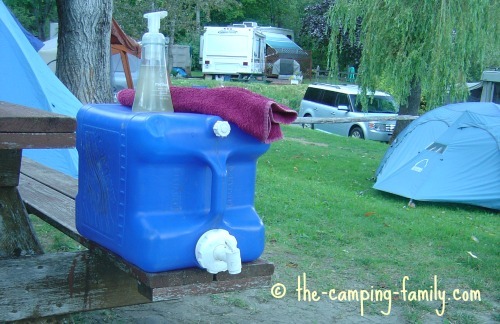 If you cook at a sink inside your RV and you don't need drinkable water outside, the laundry detergent dispenser could work fine. 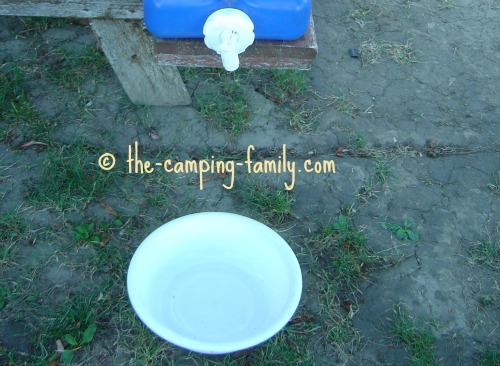 I use a plastic water jug for my cooking and handwashing water. Use a bungee cord to fasten a paper towel dispenser to your handwashing jug. The bungee cord idea is ingenious - but why waste paper towels? You'll go through a lot on a typical camping day! A cloth towel works just fine. I keep a soap foam pump on top of the jug beside the towel. I put a plastic basin under the spigot to catch the water. My system works really well for us! The verdict: Repurposing a laundry detergent dispenser is a good idea as long as you don't use the water for cooking or drinking. A cloth towel works just as well as paper towels for drying hands, and is more economical and less wasteful. Here's what you need to make your own refillable soap dispenser. Just put a few squirts of liquid castile soap in the bottle, fill the bottle with water, and give a few pumps to get things going. These soap pumps are inexpensive, but durable. I have reused a pump for a couple of years! 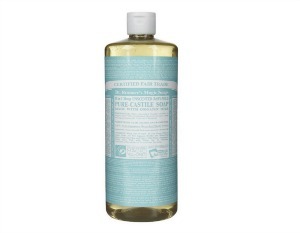 This wonderful liquid castile soap comes in a variety of scents. My favorite is the Citrus Orange. I like this idea! It's easy to do, and it works. 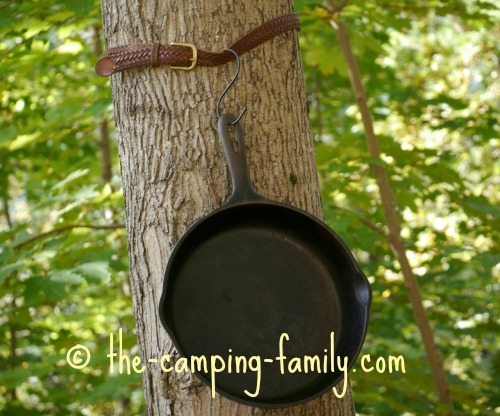 If you are staying in one place for a while, it could be nice to have your pots and pans hung neatly in a tree near the picnic table. I used an old belt and a metal hook that I found in the garage. You could make hooks quite easily with pieces of wire coat hanger, too. I like having a well-organized camping kitchen! If you are camping in bear territory, though, you'll want to store all of your cooking gear securely when you leave the campsite and when you go to bed - which means that you'll have to take the pots and pans off the tree and put them in your vehicle or in a bear-proof container. Here's more information about bear safety. The verdict: A cool idea! 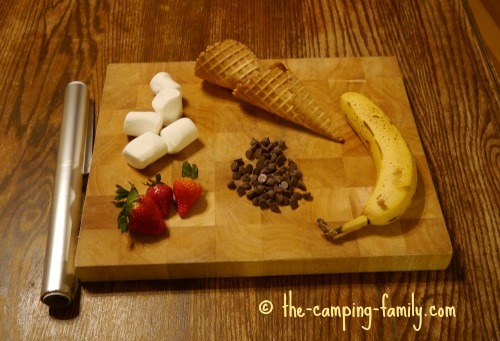 We love cooking over the campfire, so we were delighted to try this new idea. We didn't get around to doing this in the summer, though, so we tried it at home in the woodstove! 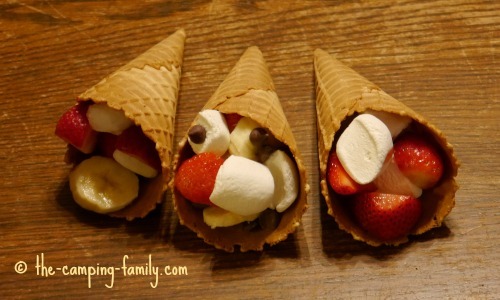 Assemble your ingredients: ice cream cones (we used waffle cones but the regular type would work fine too), marshmallows, chocolate chips and fruit. Make sure you have a roll of aluminum foil. Cut the marshmallows and the fruit into small pieces. Fill the cones with the goodies. Check the cones periodically. When the marshmallows and chocolate chips are melted, your treat is ready to eat! If you try this, be sure to use oven mitts or campfire gloves and be aware of the escaping steam when you open the foil packets. You might want to wrap each cone in a distinctive manner so you can tell whose is whose. These are fun to make and good to eat! Are you just joining us now? 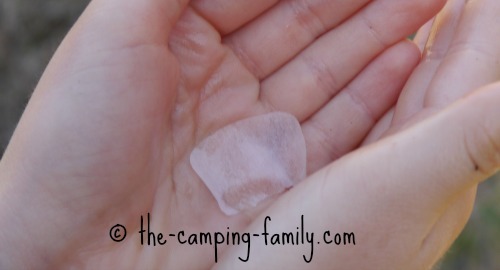 Be sure to read the entire series of camping hacks, starting with Part 1. 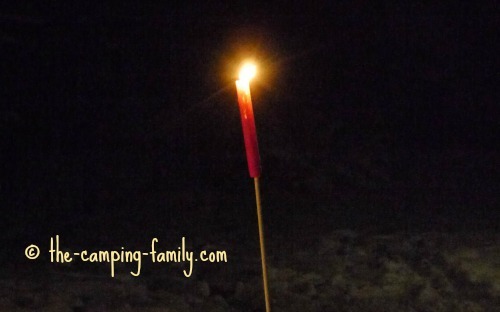 Visit The Camping Family's home page for lots more great camping ideas.